Every parity game is a combinatorial representation of a closed Boolean μ-term. When interpreted in a distributive lattice every Boolean μ-term is equivalent to a fixed-point free term. The alternationdepth hierarchy is therefore trivial in this case. This is not the case for non distributive lattices, as the second author has shown that the alternation -depth hierarchy is infinite. 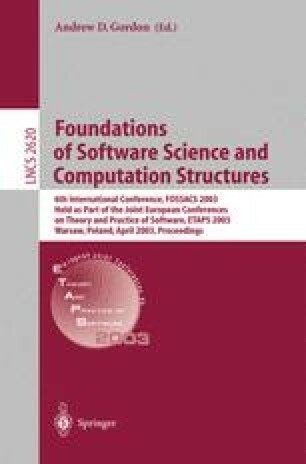 In this paper we show that the alternation-depth hierarchy of the games μ-calculus, with its interpretation in the class of all complete lattices, has a nice characterization of ambiguous classes: every parity game which is equivalent both to a game in σn+1 and to a game πn+1 is also equivalent to a game obtained by composing games in σn and πn. The second author acknowledges .nancial support from the European Commission through an individual Marie Curie fellowship.